Primary crushers hold the key to successful ore processing. E&MJ asked some of the world’s leading manufacturers for their insights into the technology and current practice. In practical terms, a primary crusher—be it a gyratory or a jaw crusher—is asked to handle everything that the mine can dump in it, and still keep working. It may need some assistance from time to time from a boom-mounted breaker to handle grossly oversized rocks, but aside from that, it is on its own. Apart from regular planned maintenance and the downtime needed to replace wear parts, primary crushers are expected—and designed—to work round the clock, handling throughputs that can often exceed 100,000 mt/d. And to do so with minimum energy input and optimum operating cost. Jaw crushers first became available in the 1830s; gyratories 50 years later, and it was quickly demonstrated that at an equal inlet size, the gyratory could process over three times as much tonnage. 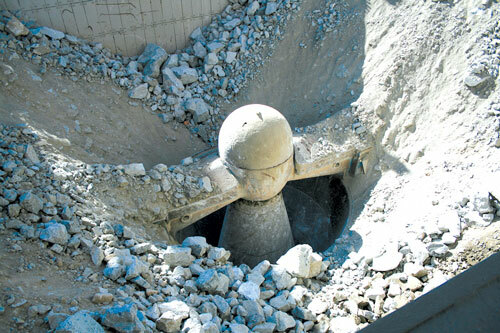 As mines got bigger, so did the crushers handling their output—and the size of the installations needed to house the crushers, both on surface and underground. A Sandvik CG820 gyratory crusher, showing the intake, spider arms and cap, and rim liners. The choice between gyratory and jaw crushers in primary installations is governed by a number of factors, including the required throughput and product size, run-of-mine rock characteristics in terms of size, abrasiveness and stickiness, available installation space and access, feeding system and budgetary considerations—both current and with respect of any potential expansion needs. To generalize, lower throughput, space and cost constraints will favor jaw crushing, while the need to crush more material, or to build in an allowance to do so in the future, tips the balance towards the more capital-costly gyratory. However, other factors may also come into play in the decision-making process. For example, is a single unit needed to crush all of a mine’s output, or are ore variations such that separated crushing provides better feed characteristics for subsequent recovery circuits? Is capacity redundancy needed, where rock properties seem likely to result in high wear rates, and hence the need for units to be taken off line more often for maintenance? And could a required throughput be achieved at lower total capex by using, say, two jaw crushers in parallel rather than a single gyratory? Whatever the criteria, the decisions have to be right; a primary crusher that does not perform to a mine’s requirements can easily threaten the operation’s existence. Hence the world’s manufacturers continue to invest in developing the technology, making it more reliable, more energy-efficient and more productive. E&MJ asked experts from several suppliers for their views on current trends in primary crushing, and some of the issues surrounding crushing in practice. Respondents were Christian Melgar, product line manager for gyratory crushers and strategic sales at Sandvik; Kevin Graney, product development manager at Metso; Mark Krause, general manager at McLanahan Corp.’s aggregate processing division; and Frank Drescher, head of the mining-crushing technology product group at ThyssenKrupp Industrial Solutions. Installing a Metso Superior gyratory crusher. Maximizing crusher output while minimizing energy usage will continue to be a key priority over the next decade, the company says. E&MJ’s first question centered on the significant advances that have taken place in the technology used in these crushers over the past 10–15 years. From Sandvik, Melgar considered that these have included both automation and the design of the spider bearing in gyratory crushers. “All Sandvik CG series primary gyratory crushers are now equipped with the ASRi™ automatic setting regulation system,” he said, “while our tank instrumentation monitoring system (TIMS) monitors all auxiliaries in the crusher, thus ensuring optimized lubrication. Metso’s Graney looked at design aspects, noting that while the size of primary crushers has not changed significantly during the review period, the use of process analysis tools has allowed the dynamics of the crushing action to be pushed further toward the design limits. “Throw, gyration speed and chamber design have been advanced to realize capacity and power increases of up to 15%, within the same crusher envelope,” he pointed out. Krause addressed jaw-crusher technology. “Over the last 10–15 years, many of the innovations developed for cone crushers have found their way into jaw crushers,” he said. “Hydraulic relief, in lieu of the old toggle plate; hydraulic adjustment; and even variations of stroke and speed have all been employed on jaw crushers—giving better performance and uptime. 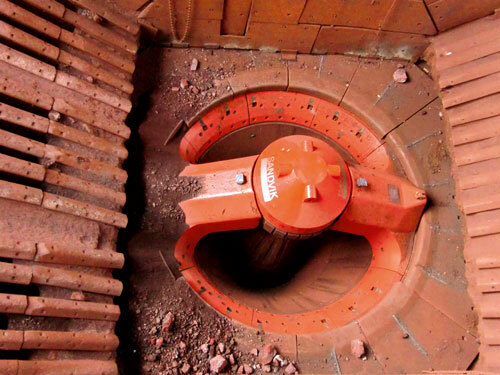 A crusher’s ability to pass uncrushable material and then reset itself provides trouble-free operation,” he added. According to Drescher at Thyssen-Krupp, there have been significant advances in performance, maintainability and reliability. “For example in the company’s KB gyratory series, the drive power has been increased to 1.2 MW by using a better design for the toothing on the bevel gear, while all TKIS crushers now have a 63-in. feed opening, which is considered best for direct-feed operations. 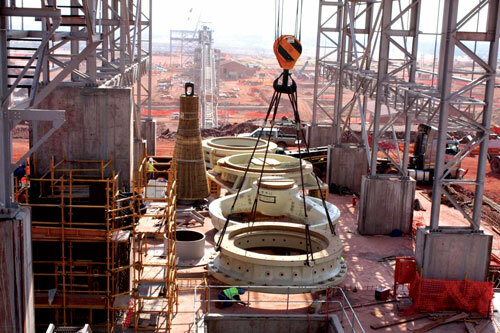 Installation work in progress on an FLSmidth primary gyratory crusher. The ability of wear parts to function effectively is critical to crusher operations. How have developments in steel and wear materials over this period contributed to these advances?, E&MJ asked. With reliability key to crusher operation, E&MJ asked the experts what the world’s manufacturers are doing to improve this even further. Melgar described some of the enhancements that Sandvik has introduced to help in this direction, and to make its crushers as robust as possible. “The unique spherical spider bearing, mentioned in my response to the first question, is very important,” he said. “There is also a state-of-the-art automation system that monitors the system all the time. Drescher: “We are continuously working on optimizing all of the mechanical components in our crushers. Some examples of this are the curved cyclo-palloid toothing on the bevel gear, using oversized bushings with runflat properties, hydraulic safety couplings and redundant lubrication systems. Energy usage is an increasingly important consideration right across mining and mineral processing. The respondents gave E&MJ their views on what is being done to help reduce energy demands for primary crushing, in terms of both crusher design and improving blast fragmentation before rock ever gets to the crusher. Krause took the view that chemical crushing is always cheaper than mechanical crushing. 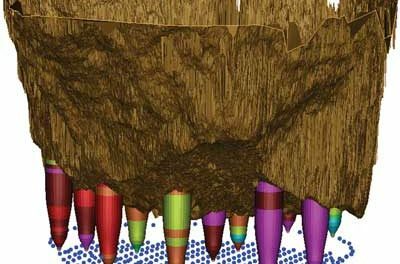 “Performing fragmentation studies using software tools like Wipfrag helps to get a better understanding of the effect of different blast patterns and materials,” he stated. Graney: “More aggressive blasting strategies will have significant benefits to total circuit energy usage (such as in a SAG-ball mill circuit), and do have some benefit at the primary crushing stage. While primary gyratory crushers by design are energy efficient, the design of the chamber has a large effect on the power draw, and maintaining the profile throughout the life has added importance. Metso continues to investigate drive options that historically have not been used in primary gyratory crusher operations. Melgar agreed, noting that for primary crushers, the per-feed ton energy consumption of typically less than 1 kWh/mt is insignificant in comparison to the fine milling process. “However,” he went on, “by having efficient and controlled blasting, good feed fragmentation will help ensure material slides down into the crushing chamber, so reducing the peaks and improving the crushing power efficiency. “Installing more efficient electric motors will improve the crushing efficiency, which means more power can be consumed for size reduction,” he added. Reducing downtime is important for crusher operation, so how are manufacturers making their primary crushers easier and more economic to maintain? Melgar looked at some of the features that Sandvik offers in its crushers to help cut operating costs, citing the spherical spider design, and the use of concave liner fixing bolts that project through the top and bottom shells. “We also use a metallic contact design in the mantle,” he said, “making it easier to get the mantle in the right position and ensure an even thickness of plastic compound all around it. Graney: “Specialized tools, such as concave carousels and trays, and machine fit concaves, simplify regular maintenance activities and reduce crusher downtime,” he said, while noting that increases in data monitoring, collection and analysis can help predict component life and can be used to notify operators of any maintenance needed. “These alerts can help plan scheduled downtime,” he explained. As with any piece of machinery, crusher operators can get into bad habits or simply do not have an understanding of how to optimize performance. E&MJ asked about common errors that the respondents see with primary crusher operation, and what they advise users to do better. Looking at gyratories, Graney reminded us that these perform best when they are full of material, so keeping the chamber full leads to better crusher efficiency. “Crushers are often operated for long periods with little or no material, so users would be better off operating for fewer hours but with higher utilization—and still maintain daily production requirements. “Low utilization is less energy-efficient, and gives higher wear rates per ton,” he added. “It is also common for operators to adjust the primary gyratory setting based on plant needs or power draw,” he went on. “But it needs to be understood that the chamber of a gyratory is designed for a specific setting (OSS), and operating outside of this risks reduced tonnage, higher power draw, irregular wear, and force concentrations in the chamber. Krause focused on the feed system for a primary crusher. 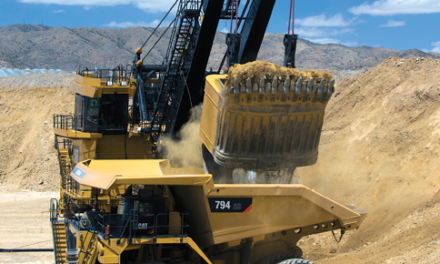 “One of the biggest errors made is undersizing the dump hopper,” he said. “This leads to inefficient load-and-haul operations, which then gives inconsistent feed going through the primary circuit. “Firstly, it’s about proper training,” Melgar stated. “Both operator and maintenance training are very important and should not be overlooked. Getting something that cannot be crushed into the crusher chamber is to be avoided wherever possible. Melgar told E&MJ that there needs to be proactive communication between the shovel operator and truck drivers, so that uncrushable objects like shovel teeth can be spotted before they end up in the crusher. “Using the crusher to find things like that can lead to costly failures—but more importantly, to downtime,” he said. “Lastly, faulty sensors in the discharge hopper can cause material to build up and back up into the crusher from underneath. Always use two or more sensors underneath the crusher, preferably of different technologies, to ensure that if one fails there is another that can sound the alarm if levels get too high,” he advised. 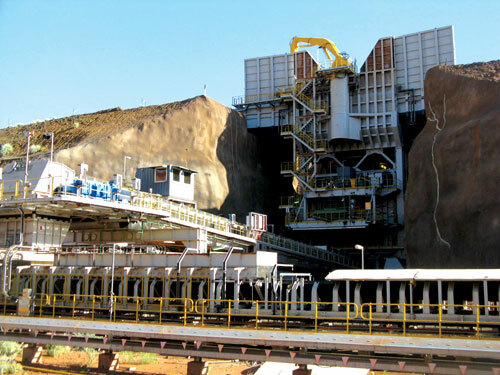 One of four TKSI semi-mobile primary crushing plants at CP Mining’s Cape Preston iron-ore mine in Western Australia, equipped with KB 63-89 gyratories. All of the experts agreed that there has been a noticeable trend towards copper and gold mines in particular having to treat harder rock, often as mine depths increase and near-surface weathered rock is depleted. What options are available for mines to maintain production through primary crushers under these conditions? Melgar pointed out that all Sandvik primary gyratories are supplied with its ASRi system that monitors the power draw, the hydroset pressure and the main shaft position in real time, adapting the crusher settings to match feed-curve and feed hardness variations. Graney: “Typically, a primary gyratory will have a similar volumetric capacity, independent of hardness, unless the rock is significantly harder. Most of the time the drop-off in capacity is due to coarser run-of-mine feed. In either case, we can look at increasing the throw, speed or OSS,” he explained. Krause: “As long as the reduction ratio is within the design limits of the machine, harder rock should not be an issue,” he stated. “Many times a jaw crusher is set tight to accommodate bottlenecks down the line, so the nip angle is compromised—thus effecting performance. 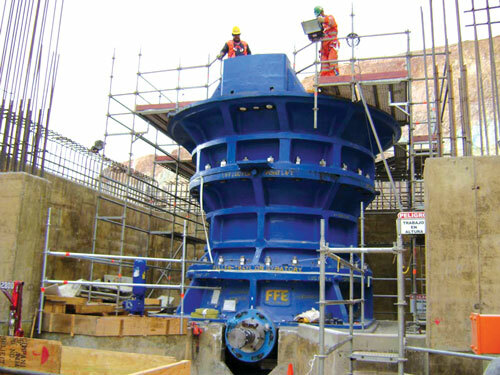 FLSmidth claims to be the only manufacturer of fourth-generation, fully top-serviced gyratory crushers, having developed the concept to help alleviate safety concerns and improve maintenance downtime. Our last question focused on the experts’ predictions for technology developments over the next decade. Graney: “It is unlikely that the capacity requirements for crushers will go down, so increased capacity will be necessary. And, of course, the increase in capacity will need to come without significant increases in the crushers’ footprint or price. “Energy efficiency will be a focus as well; how to maximize the output while minimizing the energy usage. We also think that smaller, more mobile primary crushers may increase in popularity to reduce haulage costs and allow flexibility in operations,” he said. Melgar: “One of the biggest challenges will be to improve the wear materials. Today, the longest scheduled production stop is for a liner change. Newer wear-resistant materials that prolong the maintenance interval will increase crusher availability,” he predicted. Krause looked at the way in which crushers function, and how this can be optimized. “More work needs to be done on the stroke and speed to determine the best combination for specific applications,” he stated, while adding that greater levels of automation are likely to be applied to primary crusher operations. Drescher: “At TKIS, we are seeing a clear trend of mines needing ever-higher throughput rates—not only because of lower ore grades, but also due to the need to use economies of scale to cut operating costs. This is similar to the trend that you can see with the size of mining trucks,” he pointed out. “High-capacity primary crushing installations, handling from 8,000 up to more than 10,000 mt/h are increasingly in demand,” he went on, “and that trend will continue. That in turn will require more powerful primary crushers. While we currently supply our 63 × 114 in. gyratory crushers for installations like this, we will soon be able to offer the next generation of our largest primary crushers, more compact, more reliable and with even higher performance. “In addition,” Drescher added, “we believe that the demand for in-pit crushing and conveying systems will not just remain stable, but will increase further. Rising labor, fuel and consumables costs, and the trend to more and more stringent governmental regulations and taxation schemes related to greenhouse-gas emissions—these the driving force for mining companies to rethink their conventional shovel-and-truck mining methods. Whatever the realities are in the future, one thing remains clear: the primary crusher is the king pin without which the rest of the mineral-recovery process becomes impotent. Simple in concept, the technology actually comprises a highly complex interconnected system involving mechanical strength, the use of appropriate wear-resistant materials, finely tuned control techniques and a resilient lubrication supply that are melded into a machine that can reliably withstand the toughest of working conditions. That, for sure, is not going to change.